This case study demonstrates the ability of V2G-Sim to stochastically predict grid loading from charging of plug-in vehicles, and the ability to quantify the uncertainty in grid loading predictions. Although vehicle usage among large populations follows patterns, the individual usage of vehicles can be highly unpredictable - for instance, drivers make unexpected trips, or take longer or shorter periods of time for a planned trip. These individual uncertainties, aggregated over large numbers of vehicles, ultimately create large uncertainties in the overall charging demand from PEVs on the grid. 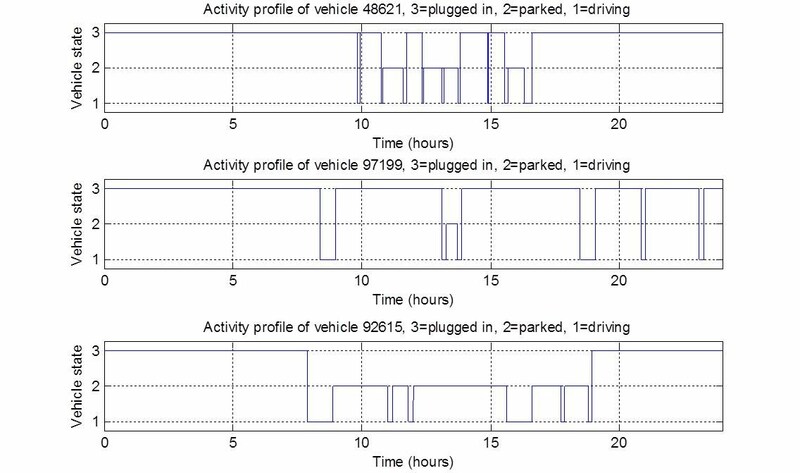 These types of vehicle-specific activity profiles are used in V2G-Sim to predict the grid charging demand impacts for the two cases specified by the input statistics. As can be seen in Figure 1, each vehicle has its own activity profile just like for vehicles in the real world with each driver having different trips with different distances at different times. V2G-Sim seamlessly predicts the grid impacts from these vehicles, while considering the individual differences in how each driver uses their vehicle. For these simulations, each vehicle is simulated to have specifications similar to a Nissan Leaf, with vehicles being charged on a mix of Level 1 and Level 2 chargers. Figure 2 shows V2G-Sim results for the case where evening charging of EVs is favored. V2G-Sim predicts the most likely grid load curve for the 1000 EVs (contour in red), and the uncertainty in grid load from 100 stochastically generated cases. Results are computed on a second-by-second time scale, enabling users to quantify the upward or downward spikes in grid demand from individual vehicles plugging in and unplugging from the grid. With this temporal resolution, V2G-Sim can interface with distribution systems models enabling users to quantify grid impacts such as transformer loading, imbalances between phases, or other grid faults. In computing the aggregate grid loading from all 1000 EVs, V2G-Sim calculates each vehicle's individual loading. This vehicle-level detail coupled with spatial information about where cars are plugging in can enable users to spatially resolve grid impacts on a distribution or transmission system as well. Figure 3 shows the V2G-Sim results for the second stochastically-generated case, where EVs are allowed to charge during the day and evening. Once again, the most likely grid loading profile and the uncertainty are shown. As can be seen in this case study, users can provide into V2G-Sim any statistical inputs describing how drivers use their vehicles. With this approach, V2G-Sim enables rapid scenario analysis to understand how different vehicle usage patterns will impact the grid. In addition to predicting overall grid load, V2G-Sim calculates the battery state-of-charge for each vehicle in second-by-second timesteps, enabling users to design their own control models to simulate any charging or discharging grid service (e.g. demand response, ancillary services, energy arbitrage, etc.). Predictions can be made for any number of vehicles, with any number of vehicle types, being driven and charged in any number of different ways on different charger types at different times. With the stochastic inputs approach, uncertainty estimates can be predicted for any parameter.